The group, who disappeared when flooding trapped them in the cave they were exploring on June 23 after a soccer game, were found by rescue divers late Monday night in the cavern in northern Chiang Rai province during a desperate search. The effort drew international help and has riveted Thailand. "Now the biggest challenge comes, to get them out, because these boys, they can't swim," said Ben Reymenants, a member of the rescue team. "There aren't too many options. Do we teach them to dive quickly? But it's a 2½-kilometre swim. Do we design some suit or mask to get them out … or do we keep pumping until the cave goes dry and we can actually walk them out? But the weather isn't on our side," he told CBC News via Skype. SEAL commander Rear Adm. Arpakorn Yookongkaew said Tuesday that seven members of his unit — including a doctor and a nurse — are now with the 12 boys and their coach in the cave where they took shelter. A pair of expert cave divers from Britain found the group about 300 to 400 metres past a section of the cave on higher ground that was thought to be where they might have taken shelter. Dr. Sura Jeetwatee, who is part of the operations, said the boys were able to walk and had survived by staying where they were and drinking water that dripped from stalactite formations. "They were smart to drink water in the cave," Sura said. 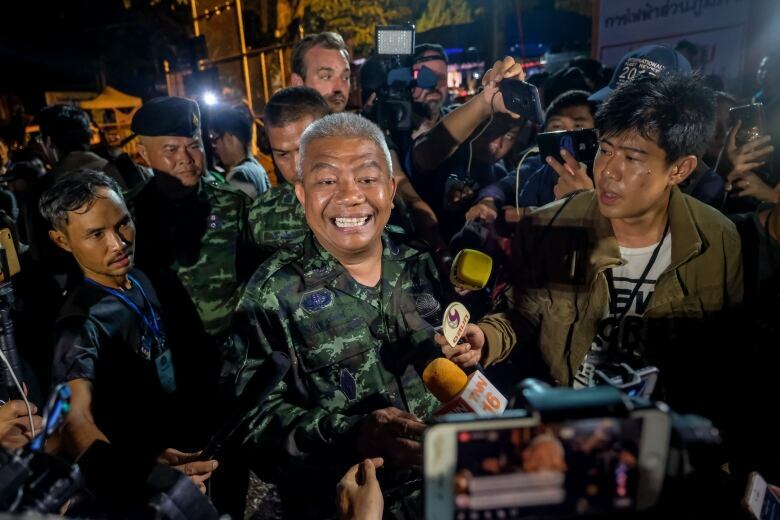 Assistant government spokesperson Col. Athisit Chainuwat said rescuers were trying to install lights, a power supply and get communications equipment to the group.